A few weeks back Google announced they were supporting authorship markup—a way to connect authors with their content on the web. This isn’t really a how-to as Google provides pretty clear instructions on how to do it. All I will do is give you a little background and point you in the right direction to get started. I have pulled out the two specific paragraphs from the above post that sum up authorship. We [Google] now support markup that enables websites to publicly link within their site from content to author pages… An author page describes and identifies the author, and can include things like the author’s bio, photo, articles and other links. I was particular interested in this idea so made strides to get in on the act, and as of today my Google authorship application has been set-up, and is now in operation. If you Google search for anything I have posted under Graham Smith such as this recent post tshirts+from+the+noun+project+ you should see my profile photo next to the search results which also conveniently links to my Google+ profile. I think this is pretty awesome and will go a long way in providing writers and authors with more visibility during search results as well as assigning a face to whoever is looking at the results. If you also rely on your website, as I do, to attract clients then this can only be a good thing. The other area where I think authorship will kick in will be with the growing number of +1’s given to genuine sites rather than those content farms and fake logo design sites posing as legitimate logo design studios. It’s no secret that these fake logo design websites have a tendency to steal the top rankings with their unruly methods which has the effect of making the hardworking, genuine and committed designers harder to find through search results. 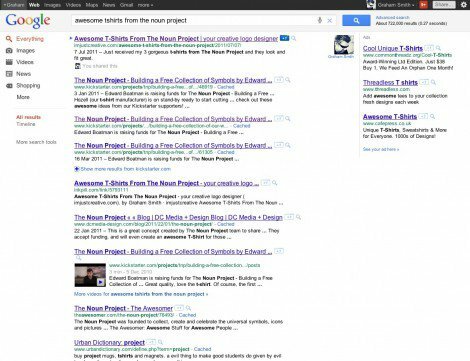 The in’s and out’s of authorship will all become apparent when you start to read Googles help article on authorship. Once you see what is involved in the implementation of authorship on your own site you will start to see how this should start to even out the playing field, and will give power back the the genuine writers and bloggers who invest time and energy in writing and posting valuable and interesting articles for the rest of us. and you will also see that genuine writers and blog contributors will have their general image and public profile raised in search results benefiting both writer and searcher. If you are fed up of playing catchup to the content farms and dodgy logo design websites then incorporating authorship markup on your website, I feel, is essential. It’s early days but I would rather start the engines now and get them warmed up ready for the long haul. 1. If you don’t have a Google profile yet then this would be your first task as without this Google will have no idea who you are, and will not be able to validate which blogs are yours. 2. Once you have a Google profile set up then the next port of call is to read Googles help article on authorship and follow, to the letter, these instructions. This basically means genetically linking your websites, author pages and Google profile to each other using the appropriate <rel=”me”> or <rel=”author”> markup within your website, and having at least one outbound link from you website to your Google profile—as you can see from the code above taken from the ijc homepage; I have linked to my Google+ profile using the <rel=”author”> markup—and vice versa. Without this 2-way link Google cannot validate or confirm that the websites you say are yours are actually yours. 3. With the 2-way bonding complete, and your Google profile list of external websites have also been configured, you can fill in the Google Authorship Request Form for the final approval process. It’s not so much an approval but more a way of Google checking your settings and being able to get back to you with any problems. The cynic in me likes to think that this last process actually acts like a cursory check-point that the website being put forward is legit. I would also like to think that any content farm or fake logo websites will first have challenges at the first hurdle in setting up a transparent Google as well as then passing a cursory inspection of their website. I have no idea if this is being a little optimistic but I do like to think this is Google starting to make a change for the better with more relevant and appropriate search results. I just wanted to reemphasis my experience with this authorship process has been really positive. After I submitted my own Google Authorship Request Form a Google representative emailed me with some changes that he felt would benefit my site in terms of the way authorship worked. This included changing the authorship markdown on my Tumblr blog from <rel=”me”> to a <rel=”author”> as well as a few changes within my Google+ profile; more specifically how I had set-up the URL’s in the Links section. 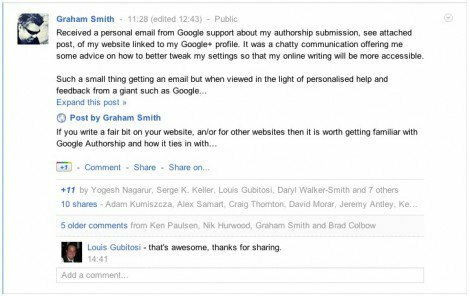 You will also notice that the”Written by Graham Smith” on each and every post also links, using <rel=”author”>, back to my Google+ profile. 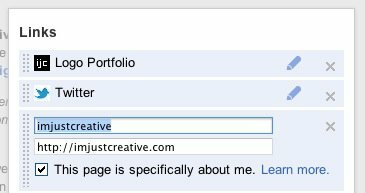 Changing entries like Twitter, imjustcreative and Facebook to “This page is specifically about me”. It’s all about the small details that make the difference in the long term. As I mentioned on Google+ earlier this personal correspondance from a Google representative was a small but very positive gesture on their part. When you add to that how the Google team are so actively joining in, and helping with the whole Google+ experience it starts to show you how committed they seem to be to make all this work. Google are showing they are listening and committed to their customers and end users. I know I am sounding like a Google fanboy; the reality is that from a branding perspective Google ARE pulling out the stops which of course includes all the site and application redesigns like Gmail. Google means business. I do have a tendency to waffle so here are the important links that I refer to throughout this post in order of relevance. If you have any further questions about authorship or Google+ then do leave a note below and I will try my best to help out. Please note that I am not an SEO guru, and I just do enough to get by in a perfectly legal and white-hat way. I am found in Google search results by clients because: I write, I blog, I actively participate in social media, and spend huge amounts of time marketing and branding myself. These are the things that will get you noticed in time. Good old fashioned hard work and commitment.